"Rowan is the most immediately-recognised of the Sorbus family, and, in its many varieties, it remains one of the most popular garden trees. Yes, even in this day and age, when the myths and superstitions are long forgotten. Or are they?" 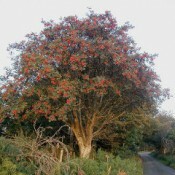 Mike Clark discusses the mythology of the rowan tree, and why it's so good to have one in your garden.